Offered in multiple window & switch configurations. Offered in black plastic, chrome plastic, polished & black billet aluminum finishes. Illuminated & Non-Illuminated styles. Door panel mounted kits includes wiring harness and plug connectors. 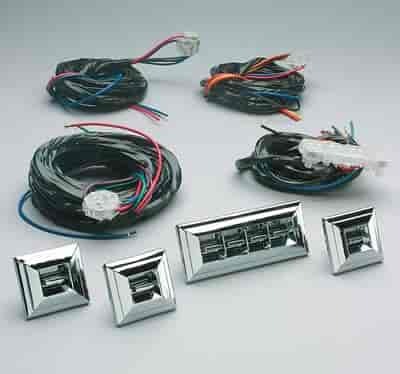 These OE-Style GM two and four door panel mounted chrome switch kits include everything you need to install the switches in your vehicle. Each two door switch kit includes one double switch pod, one single switch pod and complete wiring harness. The four door kit includes two double switch pods, three single switch pods and a complete wiring harness. Keep the original look of your stock window cranks but give your vehicle the modern comfort of Power Windows. These Electric Life switches are a Delrin housed switch that has a 20 amp reverse polarity output and will allow you to use your manual crank handle as a button. Handles not included. The Universal Switch can be mounted as a console or panel mount rocker switch kit. The black switch is illuminated and comes with three switches, one double switch bezel, one single switch bezel, wiring harness and connectors.